Two weeks ago we were invited to celebrate Día de la Independencía with our school in Chaquijyá. Celebrating in Guatemala often means dancing and Día de la Independencía was no exception. Each grade put on one or more dances and we were invited to dance as well. Since Kelsey was visiting home, it was just Dana, Cameron and me performing. Being rhythmically challenged, I have a few rules when it comes to mandatory group dances: practice a lot and get a place in the back. However, much to my dismay, we began learning the dance at 9PM the night before and with three people there was nowhere to hide. We had a great musical mash-up created by Dana and thanks to several YouTube videos we also had most of our dance moves. I really nailed the chicken dance and YMCA sections, however, Souja Boy was another story. If you think that dance is just jumping from side to side wiggling your arms, like I did, you would be wrong. So we enlisted the help of a YouTube instructor to teach us the real Souja Boy dance. Dana and Cameron caught on pretty fast, but with his clothing engulfing his body I found it impossible to see the moves that the guy on the video was doing. Maybe he just lost several hundred pounds and if that’s the case, congratulations sir! The day of the performance rolled around very quickly, probably because we learned it the night before. We threw on our matching outfits in the color of the Guatemalan flag. We also stuck a paper flag on Cameron’s shirt to really drive home the patriotic reference. The performances began with the 6th grade boys displaying amazing endurance in their 20-minute dance, which included the worm and some impressive break-dancing moves. I was glad to see that they had only learned their dance the night before as well. 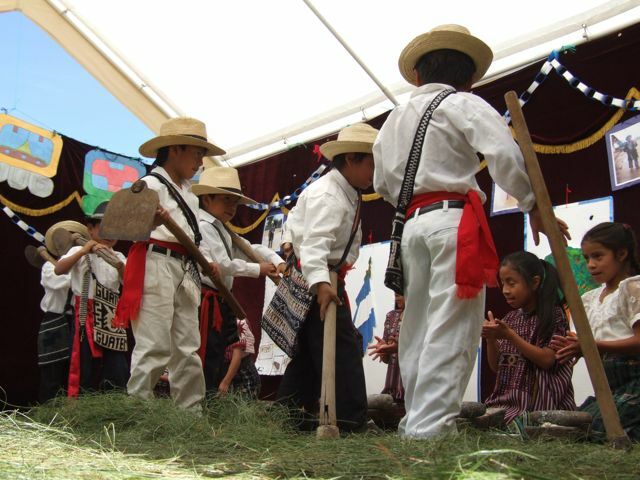 The third grade class performed a traditional dance that showed the girls and boys taking on some traditional female and male roles: the girls making tortillas and the boys working in the fields. Then Cameron performed a unique mime scene with his 5th graders. 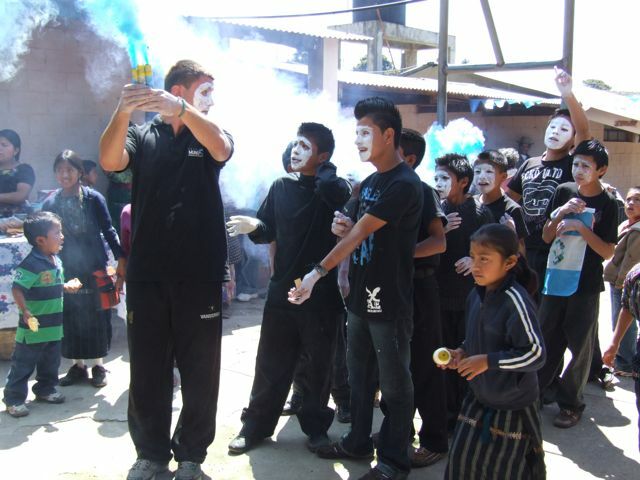 All the kids, including Cameron, wore black clothing and painted their faces and hands white. I believe it was about the voting process, but it involved a lot of sulfur-smelling smoke bombs that made it hard to see. Cameron opened the performance, carrying the smoking sticks; his painted-white face contorted into what looked like the Zoolander expression. Apparently the sticks were actively burning his hands, but at the time I found it hilarious. Finally, it was our turn. As soon as we got on the stage, I lost my composure. We were about to “dougie” in front of a bunch of traditionally dressed Maya parents and grandparents. I was laughing so hard that I could barely hear Cameron yelling the cues to me. Somehow our performance went off without a hitch. Well, obviously, I had to fake the Souja Boy dance, but we all knew that was coming. As we took our bows and surveyed the crowd there were definitely mixed expressions. Some people loved it and gave us compliments afterwards. Others were not so sure. My 4th graders told me I was a great dancer; however, video evidence suggests otherwise. After the performances we had a traditional Guatemalan lunch and got to enjoy several exciting soccer games before heading home. It had been a great day. We danced, laughed and played. I’m fairly certain I have never had that much fun on a 4th of July in the US. There’s nothing like a little public humiliation to really make a great celebration and I can’t wait until the next Guatemalan holiday… we’re going to teach the kids how to do the Chicken Dance! Working on it.. My camera died right beforehand, but we're performing again on Tuesday.